Did you miss a post in this series? Read parts two and three. I never used to be a fan of time-out. It never seemed to work. With my older three we’d do more consequence-based discipline. If they didn’t put their toys away, they didn’t get them for a few days. We also spanked (not in anger) on rare occasions for bigger offenses. But when we brought two kids home from the foster care system, spanking was not an option. Not only was it not allowed, but it can be damaging on children who’ve faced neglect and abuse. Okay, the truth is, that when we’d go there . . . I’d spill out all the issues we were having, and the therapist would give tools for how to work on behaviors. Time-out was one of these effective tools. Time-out is a technique that involves putting a child in a very boring place for a few minutes for unacceptable behaviors. The key here is BORING. You are removing your child from the fun! There are three behaviors when time-out should be used. Today we are talking about the first one. 1. When a child does not obey a parent’s direct command. This means you actually have to use a direct command. The more direct and specific the better. I was BAD about doing this. It seemed kinder to “suggest” compliance. Instead, I discovered the kindest thing is to let your child know exactly what you expect. Also, make sure you have your child’s attention. NOT when they are watching cartoons. NOT when they are in the midst of play. Walk over to your child. The direct command should be obeyed within five seconds. There should be no counting, no threats, no explanations. If your child does not comply, there is a sequence to follow. At this point the choice is the child’s choice. The child will either choose to obey or choose to not obey. If the child does not obey, then it is time for a time-out! 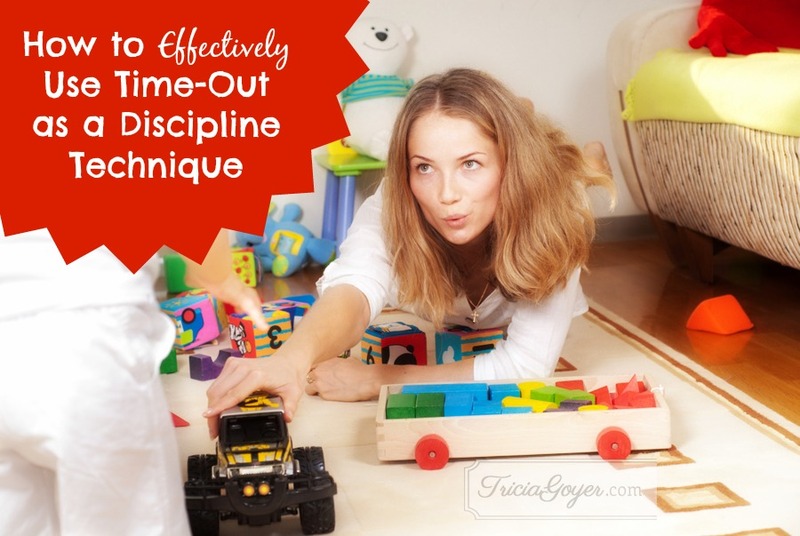 How to use time-outs as effective discipline: #parenting tips from @TriciaGoyer! Give direct commands. Get your child’s attention. Use please. Ask exactly what you want your child to do. Praise your child when the command is complete! Like me, you may be surprised by how off-the-cuff you are about asking your child to follow commands. Also, like my therapist told me, if you state a question, then your child can answer with “no.” That is perfectly acceptable . . . because you are ASKING. I’d love to hear your thoughts. Where do you fall short in asking your child to obey? I’ve always been a fan of time-outs for discipline. If there is a natural consequence, that comes first. But time-outs work great for disobeying offensives. Most recently we’ve been using time-out (nose against the wall) for our 10 year old who has respect/attitude issues. It’s a great way to let him calm down/refocus energies before dealing with the problem. I agree that “time out” can help everyone calm. I’m thankful for it! I LOVE this advice, Lisa. Thank you!!! Our family used a variety of methods for discipline and guidance when our girls were much younger (they’re 14 and 16 now and rarely need any redirection). I read very little parenting materials before becoming a parent and while my girls were babies, but what I did read stated exactly what you’ve shared here: speak clearly, make the directions easy to follow or choose; don’t ask questions when you are actually giving a direction or command. Giving directions to my children without making it a question made ALL the difference in our household. While my girls did disobey at times, it wasn’t often. They knew that I was lovingly firm, and they followed through with that. I see so many moms go into “frustration mode” with their children, leading to them getting angry with their children, all because they asked a question instead of lovingly and firmly stating the command that they needed followed. I think that a lot of moms just haven’t ever thought about changing the way they give directions to their children – so I’m not being judgmental here about this, I just find it sad. I would generally state my directions like this: “In five minutes, it’s time to clean up the toys and wash hands for lunch.” Then, in five minutes, I’d say, “It’s time to clean up the toys and wash our hands for lunch.” My children knew what I expected, and they followed my direction. Sometimes, if they wavered and didn’t want to obey, I’d point to my watch or the clock on the wall, and state, “The clock says it’s time to clean up the toys and wash our hands for lunch.” Then, the clock or the watch became “the enemy”, and they weren’t disrespectful toward me. It worked extremely well for us! What do you do if your child throws a fit and refuses time out. My two year old will not stand in time out. It takes force and often a spanking seems less physical. Looking forward to this series. I am totally loss on the new way of parenting , I raised my girlies the old ways but now I have a five year old granddaughter who can push your buttons at time . I am trying to learn the time out . Just where do I start at first to put in place? Do u have a book to tell me how and ideas. I always use the motto “when in doubt, use time out”. If you even think the behavior might be inappropriate then use time out. Hi Rita, I totally understand! This is going to be a 5-part series. You can read posts 2 & 3 along with this one!